Reprinted with permission from The Mobility Resource. As someone who loves watching shows like Say Yes to the Dress on TLC, you can imagine how excited I was when I got engaged this summer and finally had the opportunity to shop for my perfect wedding dress. Although I didn’t have bridal consultant extraordinaire Randy Fenoli by my side, I was lucky enough to be able to turn to fashion guru Christine Schwab for advice. Schwab and I both have rheumatoid arthritis and have gotten to know each other as fellow board members of the Arthritis National Research Foundation. A noted television personality and author of several fashion, beauty and lifestyle books, Schwab has shared her expert advice as a guest on many talk shows over the years. Ironically, her introduction to learning how to style women who use wheelchairs came when she was asked to do several fashion makeovers for what was then Live with Regis & Kathie Lee. Since I also use a wheelchair, I knew she’d be the perfect person to turn to for advice on what to look for in a wedding dress. Many of her tips can be found throughout this article, along with helpful advice from other fashion experts and even a few brides themselves. By following their recommendations, I was able to find my perfect dress and there’s no doubt that you will too. If you recently got engaged and are ready to start shopping for a dress, it’s best to make an appointment with the bridal shop ahead of time—especially if you have a disability or use a wheelchair. The same goes no matter whether you plan to visit a small, privately owned bridal boutique or a chain store, like David’s Bridal. Prior to visiting, inform the store owner or manager of any special needs you have so they can accommodate you and block out ample time in the schedule for your appointment, Schwab advises. Based on my own experience, I also recommend recruiting a few close family members or several bridesmaids to assist you in trying dresses on, as it definitely takes a few hands. If you are unable to find people to help, Cheryl Davids, who works as the store manager at David’s Bridal in Lawrenceville, New Jersey, says their consultants are always happy to assist. This is something I have found to be true at each of the David’s Bridal stores I’ve visited in three different states over the years. Prior to the appointment, “the bride should have her hair and make-up done so that she will be able to see herself (as planned) in the dress she chooses. I recommend this for anyone who shops,” Schwab adds. Schwab also recommends that brides wear clothing that that they can easily get off and on. Brides should also bring along appropriate undergarments, including nylons and “any jewelry that they want to wear to see how it works with the dress and a similar type of shoe. You pick the shoes after the dress but you want something that resembles what you will be wearing on the wedding day,” she says. Since the process can be overwhelming and a bit draining, Davids does her best to accommodate each bride because she wants them to feel relaxed so they can enjoy the experience. She also says brides should be worry-free, which means they shouldn’t be afraid to share their opinions and trust in the consultants for expert advice. Often, the bride feels pressured to make a decision about a dress that day. To avoid that, make it clear that you want someone to take pictures of you wearing the dresses you like so that you can review them later when you feel more relaxed and are able to be more objective. “Sometimes, we see ourselves in a different light if we see a photo,” Schwab says. Jackie Bartels Entjer, who is paralyzed and resides in Denver, Colorado, also appreciated having her mother and sister around to help since trying on gowns proved difficult due to the many layers of fabric. Fortunately, “the ladies at the salon were also very helpful,” she said. Based on that experience, “I chose a very fitted mermaid dress that softly flared around the lower (portion) so that it wouldn’t get in my wheels. It also had a short train, so I left it bustled and it didn’t get in my wheels,” Entjer added. 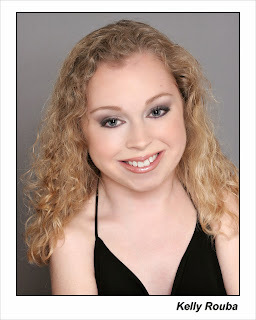 As a long-time model and founder of the online magazine for women, mobileWOMEN.org in wheelchairs, Wendy Crawford knew she wanted a dress similar to what Schwab described when she got married two years ago. “I wanted to find a dress without a train and one that was not too full. Volume gets to be too much when sitting. Instead, it’s best to focus on the detail on top,” Crawford says. Schwab echoes those sentiments and recommends brides look for beaded or brocade tops if they can’t have a full skirt due to a wheelchair. Although Crawford’s gown did not have any special beading, she did end up selecting one with ruching that was designed by Nicole Miller. “For me, ruching down the torso worked well because it kept it fitted and it is forgiving in tummy area,” she said, noting that she added straps to keep the top of the dress in place. Crawford points out that some wedding dresses come in two pieces, meaning a skirt and a top. Typically, these dresses are much less bulky and easier to put on. “If you keep the color consistent, you won’t be able to tell it’s two pieces. Oftentimes, the bottom fabric of the dress is different anyway,” she said. When I first mentioned I wanted to begin looking for my wedding dress, my mother thought it was a bit too soon. However, she soon learned from bridal consultants and several bridal checklists, that a bride should begin her search about a year ahead of the wedding—if possible. This is in part because it can take quite a few months to get a dress after ordering it. In fact, I almost purchased the first dress I tried on at a local bridal shop called Fantasy Weddings by Anna Marie in Robbinsville, New Jersey and was told it would take 6 to 8 months to come in. My mother was definitely a bit surprised by that. Brides must also keep in mind that a seamstress will likely need to make alterations to the dress and that can take another few months. Kelly in the perfect dress! Fortunately, during a visit to David’s Bridal to help my bridesmaids find their dress, I ended up finding the dress of my dreams. As it turns out, it fits like a glove and cost me a fraction of the price! I am glad my mother and my matron of honor insisted I continue searching after visiting the first store, even though we all loved the first dress too. I also learned that most dresses can be altered and embellished to suit one’s fancy. In my case, I decided to remove the straps and add a small rhinestone accent to the gown. After putting on a few rhinestone brooches and belts that didn’t look quite right, Conley-Letts suggested we try a rhinestone shoe clip they had instead. Surprisingly, it added the perfect touch I was looking for, and I was glad I spoke up because it made me love the dress even more. I also appreciated her creativity in trying to accommodate my request. That aside, I also recommend brides try on veils and some accessories with each dress because it really pulls the whole look together and gives one a better perspective. I was glad consultants at both shops did this for me because it really helped make the dresses pop. I was also fortunate enough to have my mom and matron of honor by my side at both stores I visited. At David’s Bridal, I was also joined by maid of honor and one of my bridesmaids. I appreciated their suggestions, support, and assistance. It really made the day much more pleasurable and fun—as it should be. The staff at both stores truly couldn’t have been nicer, which really made me feel at ease. Is Custom-made the Better Way? Before I found my dress, my mother anticipated that I would need to have one made due to my disability, use of a wheelchair, and overall short stature. Luckily, I was able to get a dress that suited my needs rather quickly—and at a very affordable price. This was a huge relief, as I suspected ordering a custom-made gown would have broken my budget. “It is very costly,” Davids confirms. Fortunately, “with all the different styles and fabrics that we have at David’s Bridal, we can accommodate any bride. 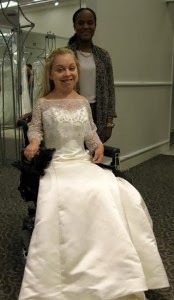 We don’t do anything custom, but we can alter (the dress) so it will fit properly.” “There’s not a dress here at David’s Bridal that I don’t think could not be altered to accommodate a bride in a wheelchair,” adds Conley-Letts. Crawford also pointed out that two-piece gowns are rather difficult to find and might need to be custom-made, especially if the bride wants a specific style. Once you’ve said “yes” to the dress, you will have to schedule fittings with a seamstress to make sure the dress is tailored to you. “We just suggest that if there is special foundations that you have to wear under the dress, that you bring those with you or special shoes or whatever you need that we can’t provide…so that you can see how the dress looks,” Davids says. When it comes to accessories, “I like simple jewelry, nothing trendy. I am not a fan of big headpieces, especially for a bride in a chair with an elegant, Kennedy style dress. Simple is always better,” Schwab adds. And don’t forget to shop for shoes! Schwab recommends flats or pretty satin pumps. That aside, Crawford says, “make sure your wheelchair is clean and decorate it if you want.” For her wedding ceremony, Crawford used a Quickie wheelchair covered in Swarovski crystals by designer Thom Browne and his staff. The manual wheelchair was actually decorated for another event Crawford helped to organize, but she decided to use the wheelchair again as it complimented her dress perfectly. White diamond wedding anniversary rings are getting additional well-liked in recent years, as a result of they give the impression of being additional trendy and easier to match with any cloths.. It's a darling dress! i really like the colors. I love small ruffles on some things, however most ruffles at a little an excessive amount of on behalf of me, and that i like single-edged ruffles over ambiguous, thus i might most likely leave these off too.
. what do you think of it. You are so beautiful Kelly. I always liked Christine designs.